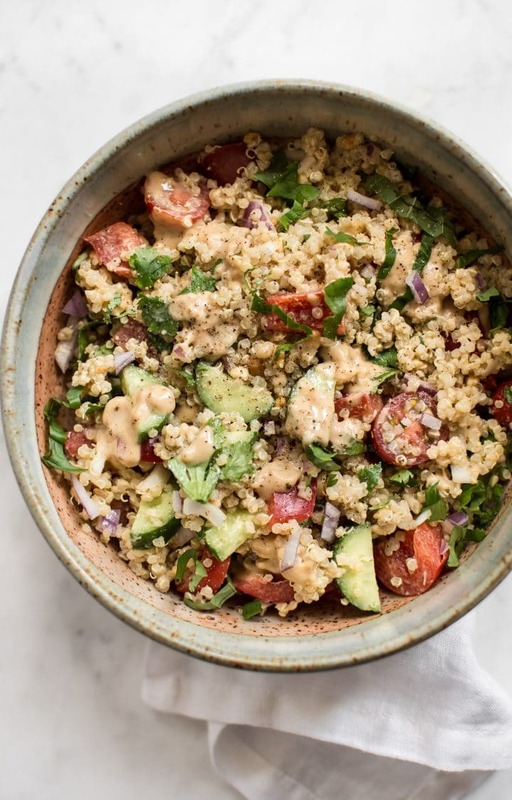 This vegan Thai quinoa salad recipe is fresh, easy, and bursting with flavor. 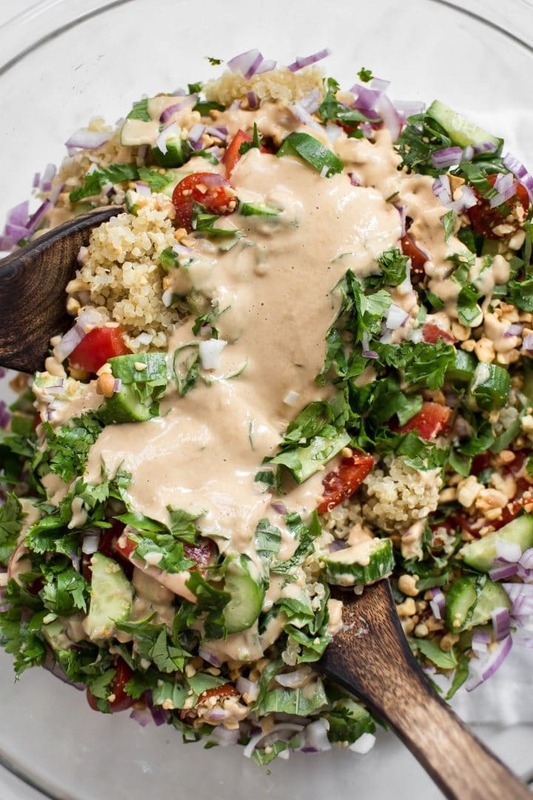 The peanut lime dressing is totally addictive! Fast & great for meal prep. I have quite a few Thai-inspired recipes on here, including curries, soups, and salads, but I’ve never done a Thai salad with quinoa before. This one is nice and filling. It’s the type of salad that works well for vegan meal prep. Yes, I’ve posted a quinoa recipe on this blog, and no, hell hasn’t frozen over (mind you, not all the snow has melted here yet, but I digress). I’m sure I said that I’d never post a quinoa recipe on this blog, so I guess I lied. Cook the quinoa according to package directions. Meanwhile, prep the other ingredients and make the dressing. Once the quinoa has cooled, toss everything together in a large bowl. Serve immediately or chill it first. This Asian quinoa salad is fairly customizable. If you don’t have some of the ingredients on hand it’s not a big deal, or say you don’t like onions or something, feel free to adjust as needed. More quinoa salads: try my ranch chicken quinoa salad or my Mediterranean quinoa salad. It’s very easy to make the dressing for this Thai salad recipe. Just add the peanut butter (I used the creamy kind), lime juice, soy sauce, olive oil, garlic, and water to a food processor and blend until it’s nice and smooth. You’ll want to drizzle it on everything (I did, anyway). 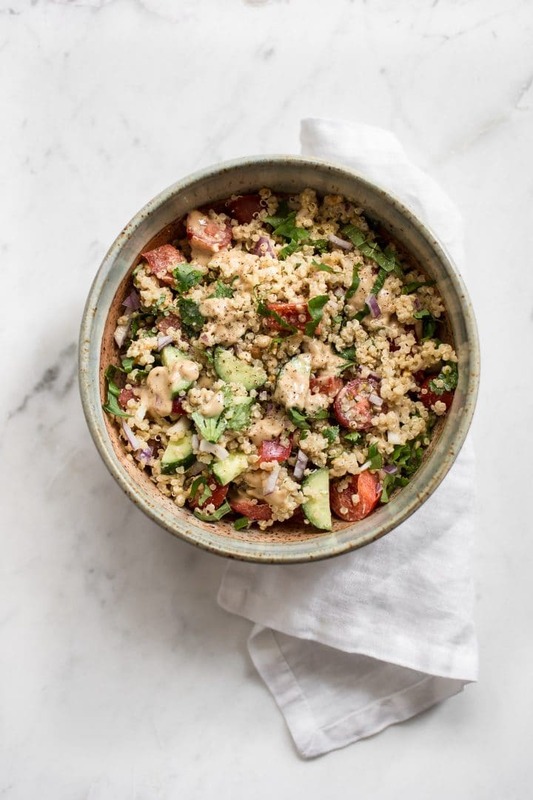 Hope you love this vegan quinoa salad recipe! Cook quinoa according to package directions. Once cooked, set aside to cool. Meanwhile, prep the veggies and herbs. Make the dressing by adding the dressing ingredients to a food processor and processing until smooth (I drizzle the water in while it's running). 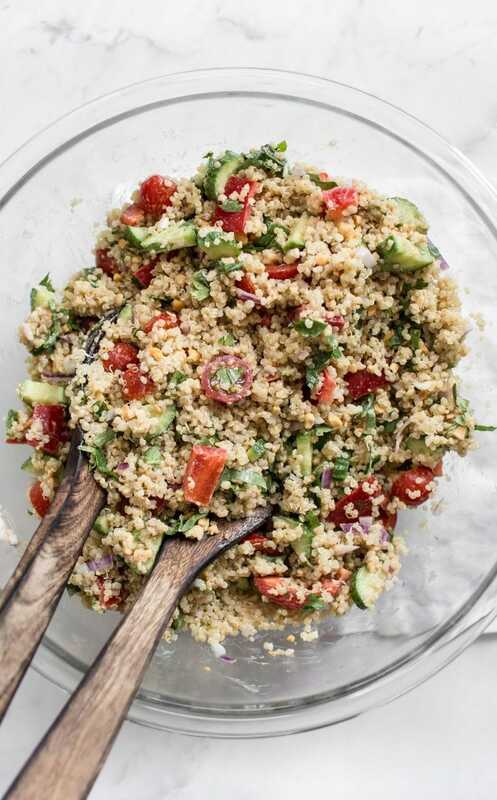 Once the quinoa is cool, add it to a large salad bowl along with the other ingredients. Toss and season with extra salt & pepper if needed. Great for meal prep so you have meals throughout the week. Love vegan salads? You may also like my grilled eggplant and spinach salad or my green lentil salad recipe. I love quinoa. You’re dumb for not liking it. Make this for me now.